What a glorious summer this is turning out to be in Western Washington. We have had two weeks of gorgeous weather! It is funny, I complain about the rain, coming from San Diego I am not used to it I don’t care how long I have lived here, but in the summertime is when I realize how green and beautiful it is here. I still miss California. However, days like these make me forget it. With all of these fantastically sunny days all I have wanted to do it be outside so I don’t miss a minute of them. So it only seems natural to me that I serve almost every meal I make on the patio. The sun, the trees, and good food just seem to all work together. On this particular day we had about 3 pounds of fresh crab meat I wanted to serve up. I knew one of the first things I wanted to make was crab salad. 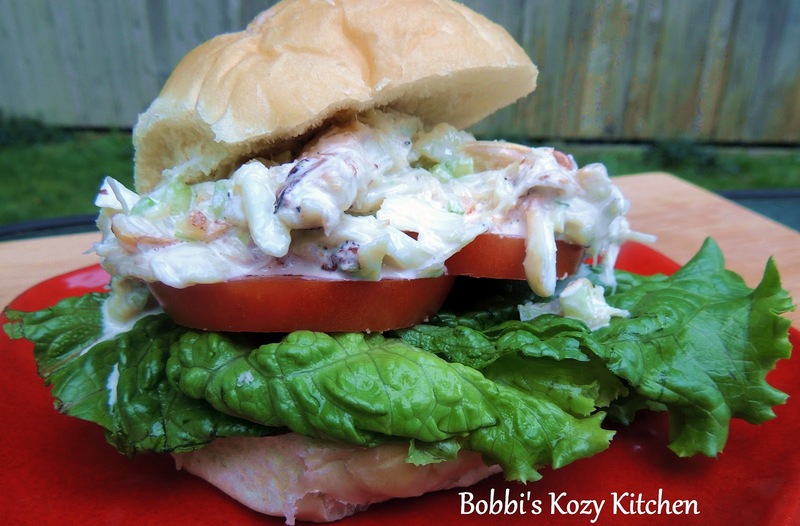 Nice cool, creamy crab salad with juicy tomatoes, crunchy lettuce, and a nice soft bun? Heaven! I also did a crab stuffed mushroom “throw down” between Paula Deen’s crab stuffed mushrooms and my healthier version. I will post that for you tomorrow and I can tell you…it was a close one!! Seth and his girlfriend Heather sat on the patio with us as I spread out the platters of stuffed mushrooms and plates of sandwiches. There were oohs and ahhhs (which I love) followed by a mad dive for the food. I just stepped back and let them have at it. After that all I heard was “Mmmmm” and “Wow this is so good” as they ate. I need to send a thank you note to the person that dropped the crab off at Kevin’s work, this meal was not only fun it was full of crabby goodness that only comes from sweet fresh crab. If you are looking for a fantastic summer sandwich for lunch or dinner, look no farther, you have found it! Combine the crab, mayo, lemon juice, celery, green onion, and seafood seasoning in a medium bowl. Stir just enough to combine all of the ingredients but don’t break the crab up too much. Season to taste with salt and pepper and stir to combine well. Place a couple of leaves of lettuce on the bottom half of the rolls, then top with two thick slices of tomato. Top them with a large scoop of the crab salad and the top of the roll.